June 28: What better day than Tau Day (or 2 Pi day if you prefer) to post the latest Mathematical love poem/ballad? I shall also point out that this is the only day of the year in which the month and day are both different perfect numbers. Anyway, Lonesome Limit began almost two years ago in summer 2012. Although I didn't have a melody in mind, this was the first time I had specifically written a song to be sung rather than a poem to be recited. Efforts to create the song/video last year fell through when several collaborators were ultimately unable to fit it into their schedules. This past year the project was put into the hands of talented media arts student Luca. From the start I had envisioned 9th grader Samyra for the female vocals. Luca recruited seniors Beau, Sam, and Jamie to handle the audio engineering/music composition and Christian for the male vocals. Luca did a splendid job fitting the planning, producing, recording, and editing into a busy schedule. In addition to regular school demands, much of his time was occupied as a member of the school soccer team that ultimately went on to win Lusher's first state championship for a team sport. We had some ideas for the video that unfortunately time didn't allow to be implemented. Most significantly perhaps, we had hoped to film the "preaching" scenes in an actual church but ended up settling for the school band room instead. The video debuted back in May as part of the Lusher Media Arts film showing at the local Prytania Movie Theatre. 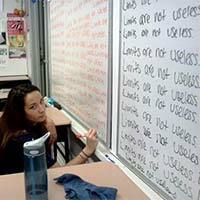 Student Cheyenne on self-imposed punishment in 2012 after word got back to me that she had told another student that "Limits are useless." It's practically impossible to convey much of the intended meaning behind this project to a general audience. Nonetheless, I believe this is the deepest of the "Mathematical Love Poem" series (if I do say so myself). Limits are the unsung hero of Calculus. Once students learn a few of the many wonderful "shortcuts" of derivative and integral Calculus (power/product/quotient/chain rules, FTC, etc), they erroneously tend to believe that limits are no longer useful. However, many times thereafter when we encounter a new dilemma that the shortcuts cannot resolve, the Lonesome Limit faithfully returns and helps us develop new techniques. 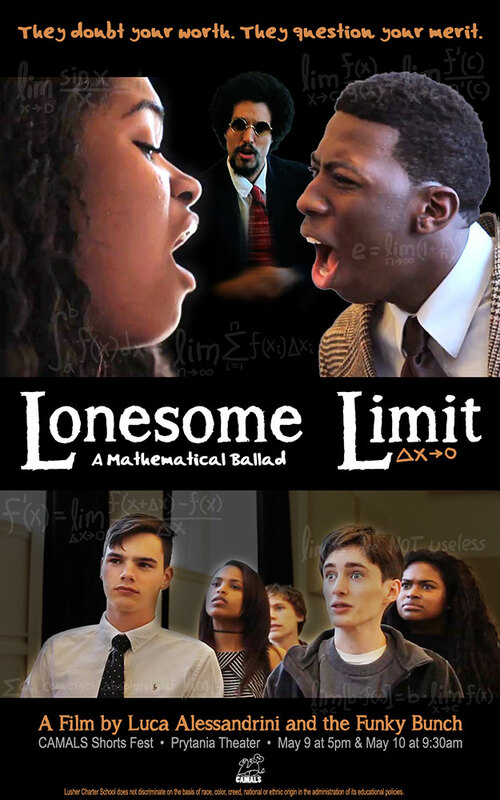 This project is intended to convey how the poor, underappreciated Limit still dutifully advances our Calculus skills no matter how much she is denied the recognition she deserves.